Despite a strong industry standing, TeleVox was viewed in simple terms: an appointment reminder service, separated from the helping nature of the company's healthcare clients. 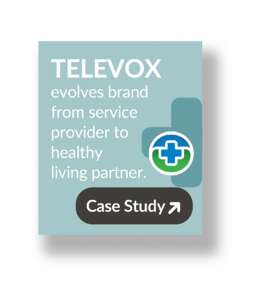 JONES worked with TeleVox to develop a new brand position, complete with original research and reports focused on improving patient health through preventative care, treatment follow-through and development of healthy habits. The resulting Healthy World Initiative surveyed more than 2,000 providers and more than 3,500 patients and produced nine separate reports. Learn more about how JONES helped transform appointment reminders into engagement communications for a healthier world. Get your copy now.